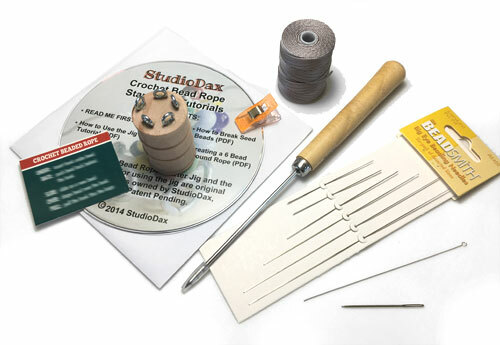 The tubular bead crochet jig and tutorial from StudioDax, patent pending, is a great method and tool to start the bead crochet ropes. If you have struggled with this technique and had a hard time with the first inch, or if you always wanted to learn bead crochet ropes, get a kit and be on your way to learn this wonderful method, the easy way! In addition, crochet hooks, perfect for making jewelry with the C-Lon Bead Cords and the other bonded nylon brands, such as Tuff, D&E or Vintage Mastex, are also now available. 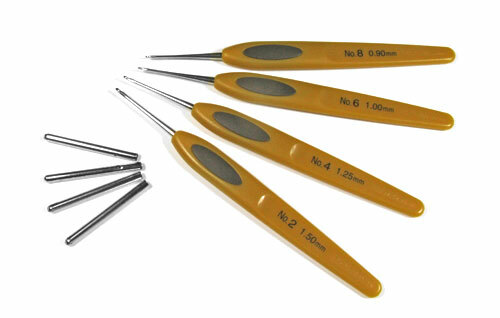 The crochet hooks are presented with recommendations as to best size. Hooks are like shoes, you either find the best fit and stick to this brand or change along the way to give yourself a rest. 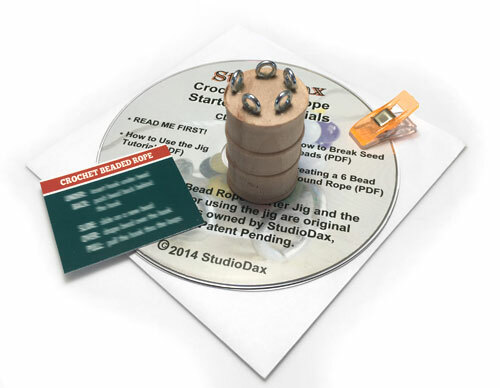 Includes the starter jig, the pdf tutorials (23 pages with over 65 pictures) stored on a CD to be opened, stored and viewed on a computer, a clip to hold your loop, and a quick reminder of the steps when adding beads (blurred on photo). The tutorial is shown for right handed crochet, but the tool is non-directional. Just follow the steps left handed and it works fine. The tutorial is written for beginners and it is best to start with size 6 seed beads, then move to size 8 seed beads. 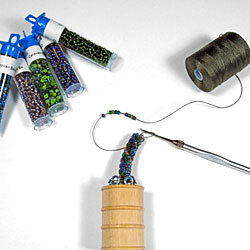 Once the technique has been mastered, you can use the jig with any size and types of beads including size 15's. To view or print the tutorialon your computer, you will need a PDF reader downloadable for free from Adobe. Or see Studio Dax Color Recommendations. If left blank , Silver is the default color. Choose a neutral cord colors, in the medium range as to light to dark, or a lighter color, such as Antique Brown, Blush, Cocoa, Flax, Indigo, Lavender, Sepia, Silver or any color that blends with your beads. If your crochet is tight, the color of the cord will be barely noticeable, unless of course you work with lots of clear or transparent beads. Darker colors such as Black are notrecommended for beginners. 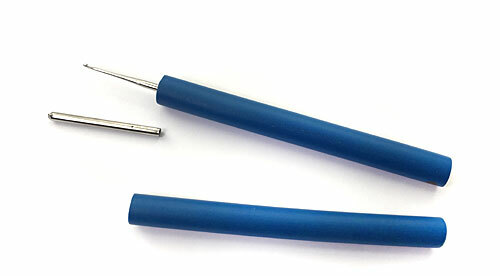 The Lacis Steel Crochet Hooks are inexpensive, but they have a very nice hook profile. They catch the nylon cord nicely and let the cord slide well when pulling the hook. Each hook comes with a metal cap to protect the point. Available from Size 1/2.35mm to 14/0.75mm. Can be improved by adding a cushion or cover over the handle. * Size 7/1.5mm is actually in between Size 5 and Size 6. Illogical, but that's how it is. 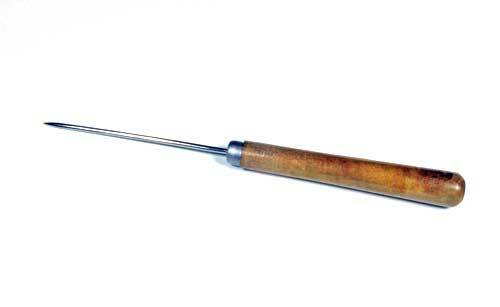 Turn the Lacis crochet hooks handle into a comfortable handle. I really like the Lacis crochet hooks because you can use a smaller hook than other brands for the same cord size. This profile, thin head but hook that can handle larger cords without snagging them makes this crochet brand my favorite for tubular bead crochet and bead crochet. But the handles are very thin and really need cushioning. 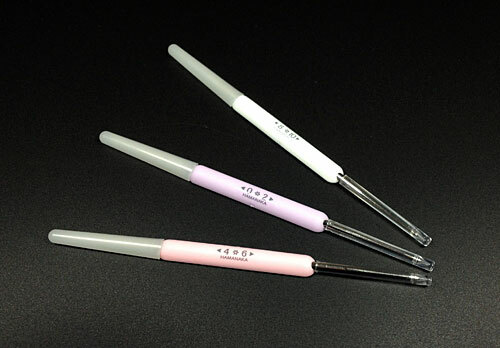 Hamanaka Double Pointed Steel Crochet Hooks are well worth their price. 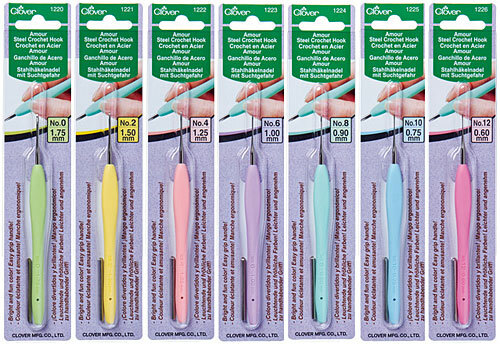 They are super comfortable to hold, very light, color coded and they have two hooks into one tool. These crochet hooks have instantly become my favorite steel ones. Lightweight and ergonomic. Feel incredibly nice in the hand. Comes with a metal cap to protect the point. Handle great to rest the thumb. 14 - Can be used to go through bead holes. Rule of thumb: For bead crochet ropes use finer (higher number) hook. For single chain crochet the larger size is usally best. Nice hook profile. Handle good for either resting thumb for scoop holding or pencil holding (side holding). Tapered shaft. Color coded handles make it easier to find the right size. 12 - Finer cord and thread or could be for pulling cords through bead holes. 7" long with a point profile that works well for breaking seed beads off the cord without damaging the cord. Made in Pakistan. Personal note - Using a wood block, insert point right into the seed bead that needs to be broken. This tool is very useful when making tubular bead crochet ropes. Patent Pending - What does it means - StudioDax has a patent pending on the jig and the actual process taught in the tutorial, so if you are a teacher and you wish to teach this method, you will need to purchase a starter kit for each and everyone of your students or you may be in violation of the patent. Contact us for quantity discount on this item. Thank you for your understanding! Personal Notes - Other Suppliers - For the red, black & white sample bracelet I used Miyuki Beads Size 6 from Caravan Beads and a coral nugget as the focal bead. For the 12mm end caps, I ordered the Acorn Top Style Bead Cap from B'Sue Boutiques. Another style you may want to consider is the Ornate Victorian Bead Caps. Both styles cover the ends well, better than filigree bead caps. They are available in a variety of finishes, are inexpressive, and when I ordered them online, they arrived promptly. Tuff Bead Cord Size 1, 2, 3 & 5 are also a very popular cord for tubulat bead crochet. 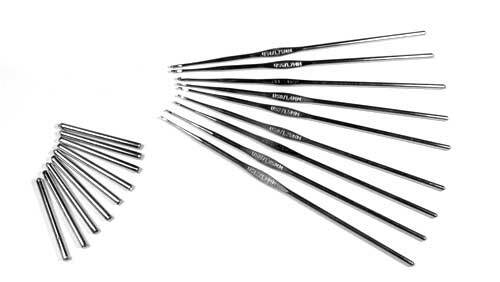 Steel Crochet Hooks Sizes and Recommendations - If you thought thread naming was confusing, try crochet hooks sizes. From one brand to another, different numbering systems are used and then to complicate thing further no standard exists on how to measure a hook, so even millimeter sizes are not a good indication to compare sizes between brands. Beware of sizes and numbers, you may have to try several sizes and brands until you find your favorites hooks for specific applications. Single chain crochet with beads is much more forgiving as to size allowing one to use larger hooks. Bead crochet ropes require more adjustments and trials as you want a thin hook to go between the beads, but still large enough so that it does not split or damage the cord. Other factors in choosing a hook are the actual profile or tip of the hook and its handle. For the handle it depends on how you hold your hook. Do you hold it as a scooper or as a a pencil? If the handle is too thin you can add padding to make the handle more comfortable - taping shelf lining padding to the hook handle works well. Another option is to attach the padding with rubber bands, so it is temporary and can be removed easily. Keep all these considerations in mind, when reading my recommendations. Your individual crochet style and technique will in the end be the final test!